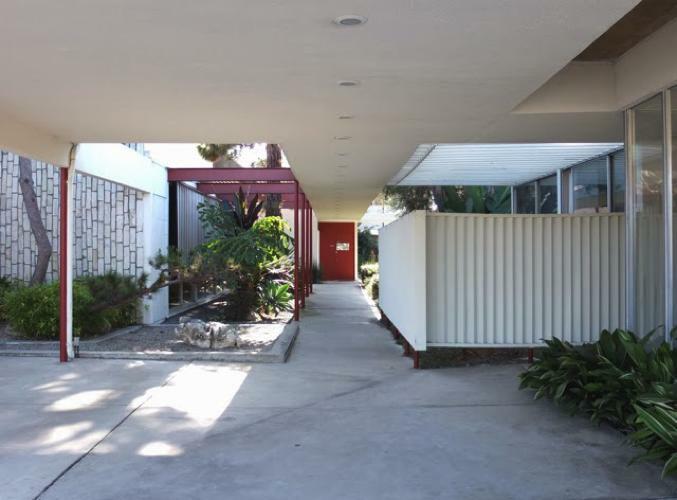 After his military service in WWl, Richard Neutra found employment at the Switzerland architect bureau of Gustav A. Amman , a German expressionist architect who’s work is characterized by streamline interpretation of industrial structures. 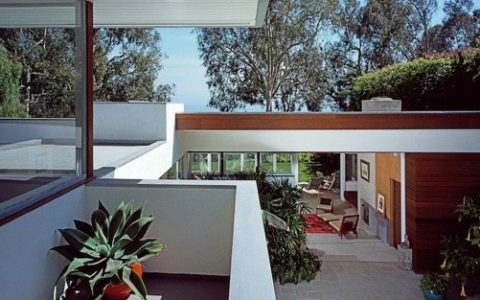 However, opportunities arises when American innovations in architectural technologies, particularly in steel constructions, led Neutra to the United tates of America in 1923. 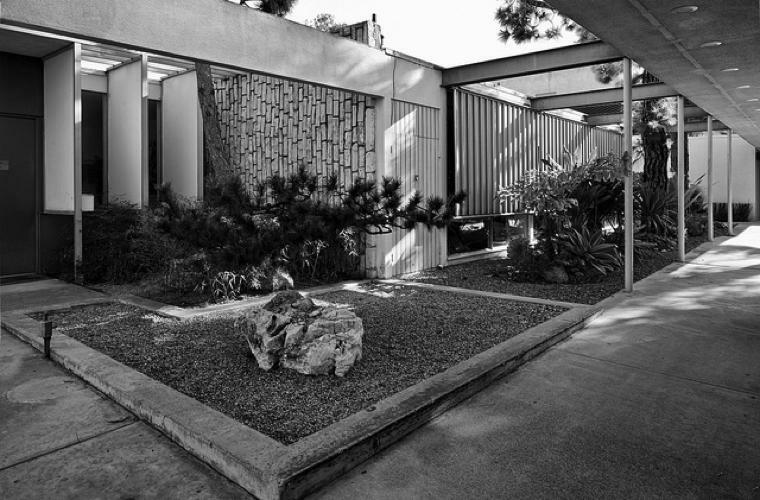 Richard Neutra worked briefly for Frank Lloyd Wright before accepting an invitation from his close friend and university companion Rudolf Schindler to work and live communally in Schindler’s house in California. 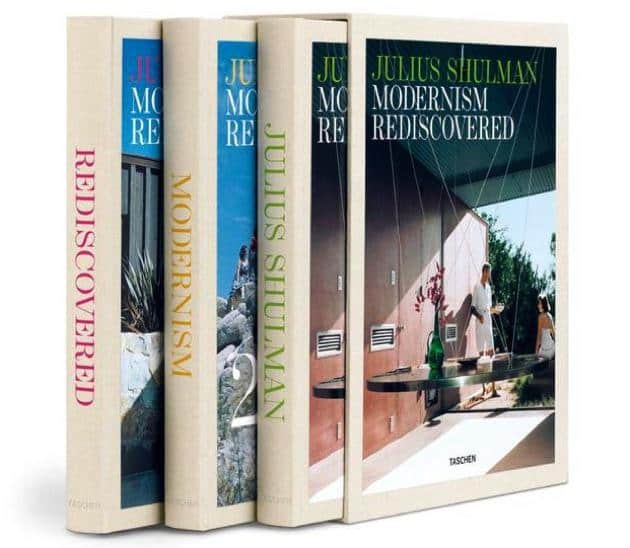 In California, he became celebrated for his rigorously geometric but airy structures that symbolized a West Coast variation on the mid-century modern residences. 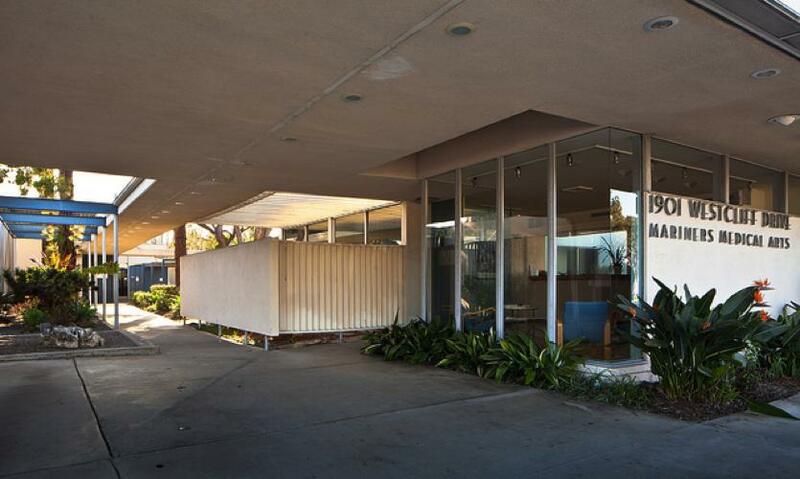 One of his best designs was the Mariners Medical Arts Center in Newport Beach, CA. Its internal functionality and good urban design made this project modern but also neighbourly friendly. 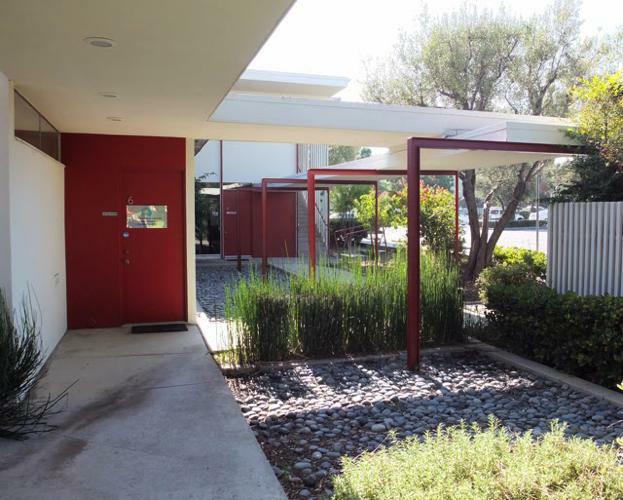 The lobby of the compound is a welcoming garden when entering from the street, proving that a clinic does not have to be forbidding and intimidating. The garden also provided the much needed privacy for a clinic and offered sufficient lighting as well. The lush tropical plants and reflective pools (today replaced by sea stones) provided tranquility to slow the pounding hearts entering the clinic. 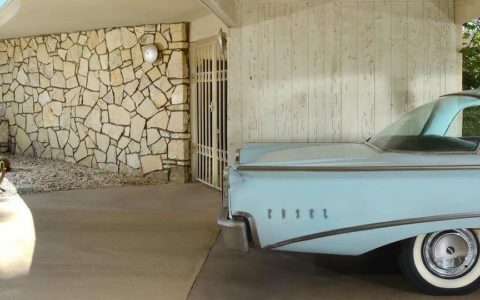 These inspirations were typical in Richard Neutra’s designs and stated the quantifiable connections between surroundings and behaviour. He was famous for the attention he gave to defining the real needs of his clients, regardless of the size of the project, in contrast to other architects eager to impose their artistic vision on a client. 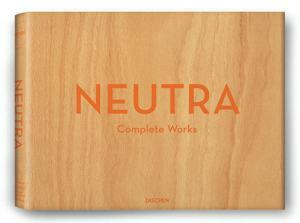 Neutra sometimes used detailed questionnaires to discover his client’s needs, much to their surprise. 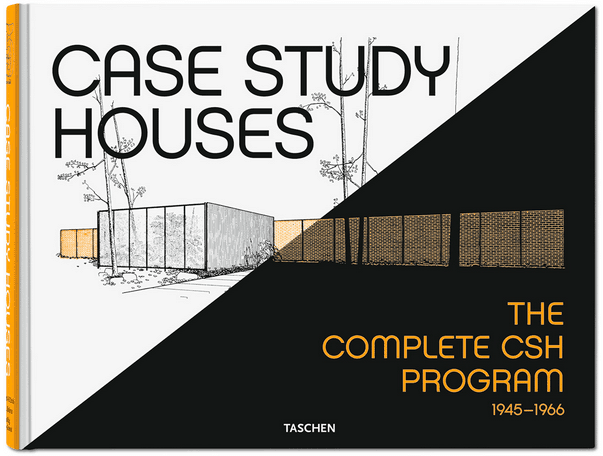 His domestic architecture was a blend of art, landscape and practical comfort. 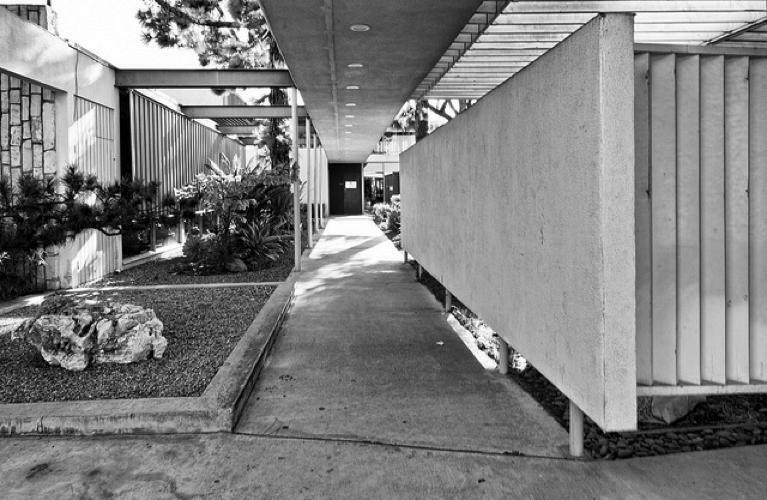 So basically, when Neutra designed the Mariners Medical Arts Center, he made sure the patient’s vision had to be diverted and distracted whilst the focus and concentration of the doctors had to be increased by the design. 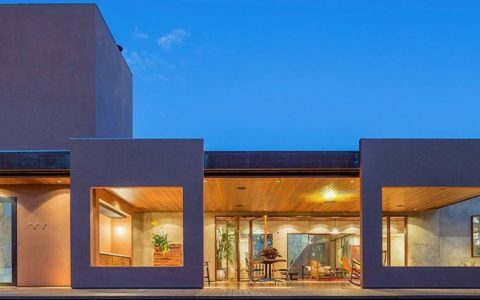 This resulted in asymmetrical coverings of the walkway between the buildings, deeply connected buildings to provide greater sense of protection and vertical metal louvers for privacy and shading. 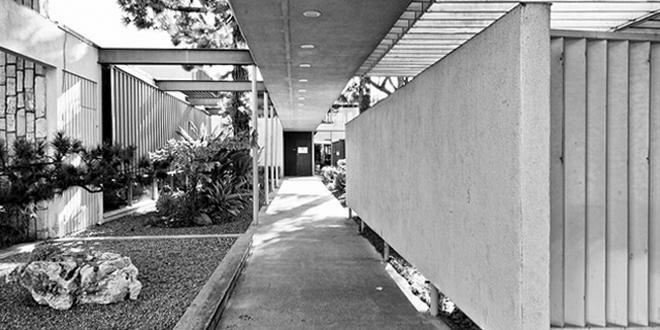 Richard Neutra Mariners Medical Arts Center’s site sits 45 degrees off the north, which is the most difficult orientation for sun protection, receiving sunlight on all sides but no two sides receiving the hottest afternoon sun.